Gil Weinberg at Georgia Tech designs robots that make music. Not robots that play music, but robots that can actually create music, creatively improvising new melodies based on analysis of existing ones, allowing them to have jam sessions either by themselves, or with human musicians. Weinberg's newest project also involves musical robots collaborating with musical humans, except in a much more direct way, with the design of a cybernetic upgrade that gives a drummer who's missing an arm a robotic arm with a musical mind of its own. Georgia Tech professor Gil Weinberg (left) created a robotic prosthesis for Jason Barnes, who lost his right arm two years ago. Jason Barnes is a human drummer who lost his right arm just below the elbow a few years ago. 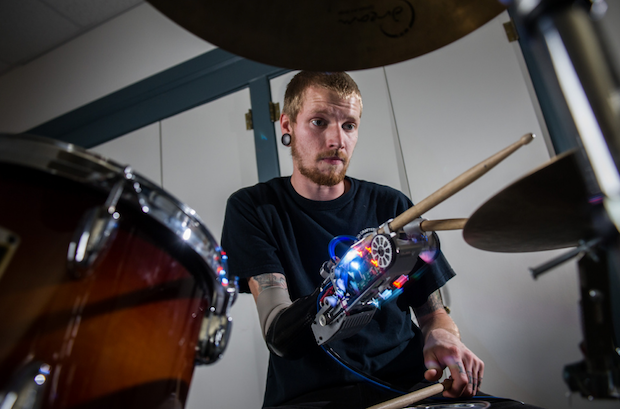 To keep drumming, he built his own prosthetic, but it didn't provide him with the same level of control as a wrist and fingers would have. Weinberg's idea was to develop a more advanced prosthetic that is controlled physically by the Jasons' arm, as well as electronically using electromyography (EMG) muscle sensors in his upper arm, allowing him to adjust the prosthetic's grip on the stick to control how much it rebounds. The device was designed by Meka Robotics in collaboration with Guy Hoffman and Roberto Aimi. So that's cool, but what's really cool is that Weinberg took things a step farther, and gave the prosthetic drumming arm a second stick. And a brain. That second stick literally has a mind of its own: it listens to the music that Jason is playing, and then improvises an accompaniment to play along with him. Jason can't control the second stick directly, but he can pull it away from the drum when he wants to play on his own. What's fascinating, though, is that the second stick allows Jason to do stuff that humans can't do. He can play faster, with a more stable beat, than any human can, because he's part robot. Weinberg says such robotic synchronization technology could potentially be used in the future by fully abled humans to control an embedded, mechanical third arm during time-sensitive operations. For example, Weinberg’s anticipation algorithms could be used to help astronauts or surgeons perform complex, physical tasks in synchronization with robotic devices. A robotic third arm? Yes, sign me up. I definitely need it to improve my ski boxing.